1 pair of tabi ; right 9.5 x 4.5 x 6.5 in., left 10 x 5 x 6.25 in. 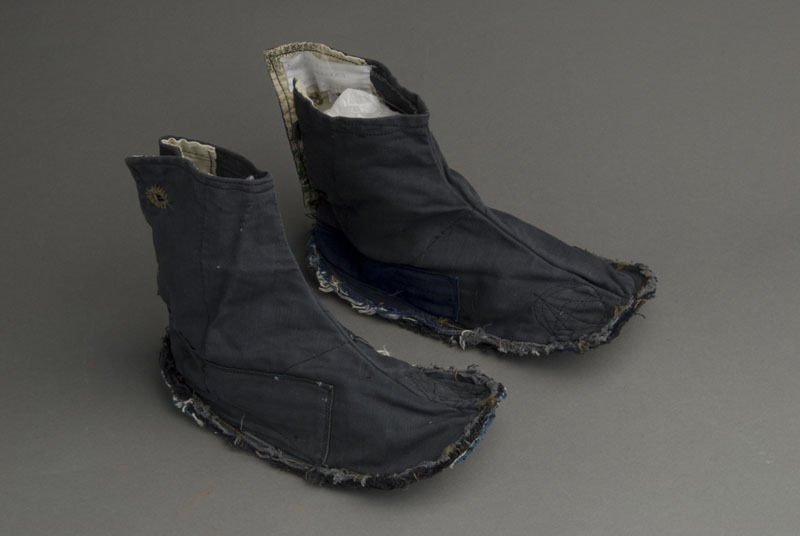 Japanese style footwear (tabi socks) made from denim with sole, heel and big toe reinforced with scrap material and threads. There is a two button closure above heel and the big toe is separated from the other toes with an interior divider. The sole is thicker than rest of tabi and curves upward at front. Both tabi: heel exterior is reinforced with black scrap material and leftover threads; back opening is lined with off-white material with green print. Left tabi: Back opening is lined with red, black and white print material on right side. These tabi were machine sewn and worn by Mrs. Kaku Kumasaka who worked at the Oahu Sugar Plantation. Leftover threads and scraps to reinforce heel. The inner lining is composed of various materials that were available to her at that time.